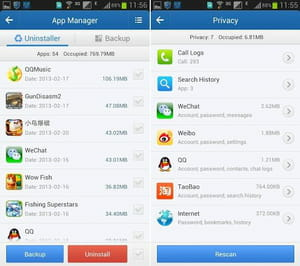 Clean Master Cleaner is an application designed to clean traces of activities on Android devices. It can delete different kinds of traces of history on the Smartphone. The aim is to free up more space and increase the device's performances. This application can improve the security settings of the device. It is dev eloped and published by EasyApps Studio. Cleaning process: the user has the choice on selecting the history that he wants to delete. For instance, it can clean Web search history, incoming and outgoing calls and even application cache. These data can significantly bother and even clutter the mobile phone performance. A simple tap enables to unleash the cleaning action and once done, data cannot be recovered any longer. Backup: Clean Master Cleaner permanently keeps track of traces of history suppression. There in, the user can have a look at the latest uninstallations and deletions according to their dates. After that, he is free to keep or clean these data depending on their needs. Management: this app is integrated with an option that can sort all elements already present or installed in the Android device. Storage is done according to various criteria such as date, size, name or the number of times data have been removed. Analysis: this option allows users to check the contents of the Smartphone. An automatic identification system enables to speed up sorting process. Clean Master Cleaner is offering more spaces after deletion. Clean Master Cleaner is downloadable for free. Latest update on May 14, 2014 at 01:58 AM.